So Google finally sent me an invite to its music service. I started the upload, at 10:40pm tonight. I have about 4000 songs (or so says Google's Music Manager software), so we'll see how long this upload takes. For now, I like the web interface. I'm disappointed there is not an iOS app for it, but I'm sure Apple will block that for obvious reasons. Amazon, for that matter, needs an iOS app for their music service too. I mean, iPhone is the #1 phone, right? You can't really count all the fragmentation that IS Android, can you? Is Android actually #1? I don't know. I don't do research. I let the blogs do that for me. I just repeat crap they say. 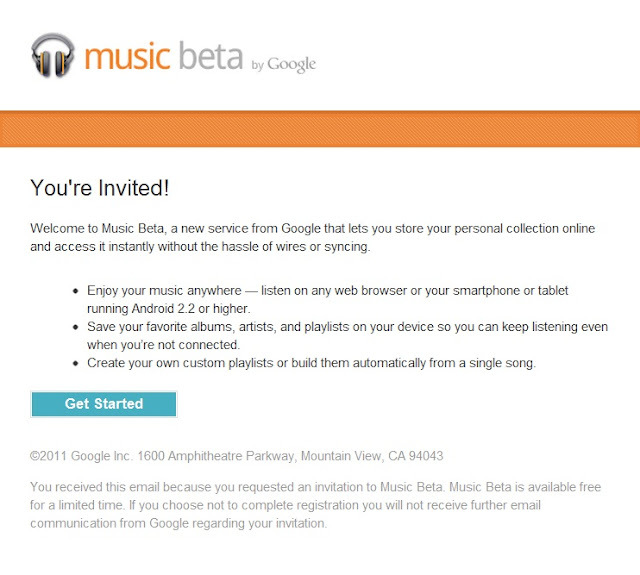 So, there's a bunch of nothing to say, I'll let you all know what I think about Music beta by Google. Thought #1: get a better name than Music beta by Google, or Music by Google, which I assume is what it will be called after coming out of beta testing. How about "Goosic"? It's Google and Music smashed together? Huh? Okay, that's more lame.